I read with interest Mr. H’s summary of Chicago’s April weather over the last several years. One of my friends was in Chicago this week and posted pics of snow. 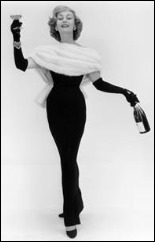 Right now I’m still planning a ball gown for this year’s Histalkapalooza, so I’m crossing my fingers against rain, snow, sleet, hail, and slush. I do have an opera length coat at the ready, but I am not looking forward to figuring out how to pack it all. The fact that I’m thinking about HIMSS planning right now underscores the fact that I’m procrastinating the continued reading of the Meaningful Use Stage 3 documents that were released last Friday. I’ve only received a couple of pre-meeting mailers, but there have been a couple of ads in healthcare IT publications that caught my eye. Sponsor ChartMaxx is giving away some Chicago pizzeria gift baskets in their “Grab a Slice of the Windy City” promotion. Winners could receive a gift basket and pizzas delivered to their home – sign me up for that one. The two mailers I did receive both mentioned Apple Watches, but I’m not an iPhone girl, so they didn’t engage me. Additionally, one had my title wrong and another botched the address. It never ceases to amaze me when a mail merge goes awry or that people don’t proof things before they go out. 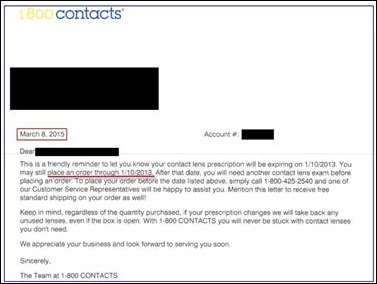 Speaking of proofreading, I wonder if 1-800-Contacts realizes that their most recent mailing provides a possible time-travel option for customers? Although it was mailed earlier this month, it invited me to place an order through January 2013. I guess it’s not just conference marketers who can’t get it straight, but I’m wondering if I can call and see if they’ll honor their 2013 pricing. Procrastinating on the Meaningful Use documents also means catching up on journals this week. I’ve been doing a better job of keeping the pile on my entryway table to a minimum, but still am not current. A blurb about using Fitbit devices to predict recovery from back surgery caught my eye, however. Researchers at Northwestern University, New York University, and the University of California-San Francisco are looking at patient activity four weeks prior to a procedure and six months after. Preliminary data shows that patients not only reach their pre-procedure activity level after about a month, but continue to increase to levels that weren’t possible prior to surgery. Although they’re only looking at a subset of spine surgery procedures, I like the idea of capturing that data to model real-world results. I’m glad I went through the journal pile because nestled in the back pages of American Family Physician was a “Patient Oriented Evidence that Matters” (POEM) segment answering the question of whether computerized decision support systems linked to EHRs improve patient outcomes. The ‘not really’ response cites a recent meta-analysis and I’m glad I read the original article. It was a little less pessimistic than the “bottom line” summary provided in the POEM. I printed a couple of copies of the actual paper to keep on my desk because I’m sure someone will bring the summary in next week as support for why we should not have an EHR. I’ll be ready when they do because at this point EHRs are not going away, but I do love a good medical literature spitting match. Going back to January in the stack, I also found reference to an editorial in the Annals of Family Medicine that talks about allowing medical students to use EHRs so that they’ll be ready for later phases of training such as residency. Our students get a lot of experience with EHRs in our academic hospitals, but very little when they’re on their community-based rotations. The barriers cited by our sponsoring physicians include licensing issues with EHR vendors, lack of dedicated training for students, inability to separate student documentation from rendering physician documentation, and the transient nature of clinical rotations. Most of these were echoed in the editorial, which also mentions the need for students to learn how to manage populations using registries and other analytic components of EHRs. I’ll be interested to see how the current generation of medical school and residency grads use EHRs after completing their training. In many parts of the country, we’re to the point where students may not even be exposed to paper charts. In my area, even our community free clinics are using EHRs. I’d love to do a study of new physician interactions with patients in an EHR-enabled exam room vs. physicians who transitioned from paper charts. Got grant money? Email me. Just a general comment…..I am a 28 year veteran of HIT with a nursing background and I thoroughly enjoy your posts on HISTalk. Your insights are totally grounded in reality and not just the typical theoretical jive talk that is so prevalent in our industry.